I know what you’re thinking: Do I really need another TV show to watch, Megan? And you’re right. The amount of TV we are presented with between cable, premium channels, apps, streaming services and YouTube is so daunting that it’s almost exhausting. I myself am weary of taking on new shows. But I urge you to go with me on this one. Last year, TNT launched a serial version of the 2010 Australian film Animal Kingdom — a film that was criminally underrated despite Jackie Weaver sweeping up every nomination possible for her role as the matriarch of the Cody family. The film is a story about a teenage boy whose mother overdosed, forcing him to go live with a family he hardly knows anymore. However, this is no ordinary family. He hasn’t seen his grandmother or uncles in years as his mother refused to allow him to partake in their less than legal activities. But the teenager, J, has no other option; it’s this family he barely knows or staying with a friend of his mother’s. He makes the choice to live with Smurf, his grandmother, and discovers every reason his mother wanted him to stay away from them. Here are four reasons that this show needs to be on your radar. Like, ASAP. Generally speaking, we’re used to the idea of a dysfunctional family on TV. More often than not, it’s the type of family we’re shown to make television seem more realistic. But the Cody family is something else. Smurf — the matriarch, played brilliantly by Ellen Barkin — has raised her sons to be criminals. She has taught them how to rob banks, steal from everyone around them, and how to not get caught. Talk about a different sort of upbringing, right? Instead of raising her children to be upstanding citizens, she teaches them that the best way to make money is to steal it from those who least suspect it. And she’s the one pulling the purse strings. If she doesn’t like what they did, they’re not getting their cut. It’s fantastic. There are a lot of characters who have to work within this family dynamic while also dealing with their own stories. They have to find out who they are, where they fit in, and ultimately how that affects their lives outside of the family. They don’t agree with the plan or they want to stand up to another member of the family. One doesn’t want to talk about his sexual orientation for fear it will have him ostracized, and one is just so bizarre that you wonder if he’s even okay in the head. The writers have the overall narrative, but they also depict the uniqueness of each and every character — all while creating amazing stories each week. To take what was great about the film, draw it out and make it better is quite the feat that they pull of beautifully. I love my TV shows. I really do. I watch too many and sometimes I get burnt out on them piling up on my DVR. Then sometimes a show comes along that has me wondering how I’m supposed to wait a week for the next episode. Animal Kingdom is that type of show. How many shows are like that? This cast is incredible. While only having two relatively known names — Ellen Barkin and Scott Speedman of Felicity fame — it allows the rest of the cast to be filled out with relative unknowns. Also, the dudes are just super hot. It’s so annoying. And they have so many shirtless scenes — since they’re adventurous California surfers. Animal Kingdom is an impressive stand-out during a peak time for television. It’s dark and gritty, but has heart and depth. They are not bold for boldness' sake, nor is the show a cheesy family drama that toes the line of being too unrealistic. It strikes the perfect balance between action, drama, suspense, and intrigue. You’re missing out if this isn’t on your summer watch list! 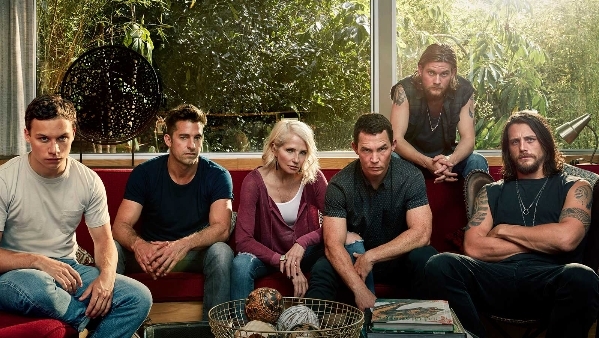 Animal Kingdom returns to TNT tonight at 9 PM EST. Set your DVRs, catch up on season one, and get in with the Cody family. You certainly won’t regret it.